Tiny homes come in many shapes and sizes, all small. You’ve seen tiny homes made of storage containers, cabooses and built on flat bed trailers. So what is a Park Model RV? A Park Model RV is a hybrid between a tiny house, an RV and a manufactured house. In truth, Park Model RV’s are nothing new. In fact, they have been around as long as there have been mobile homes. 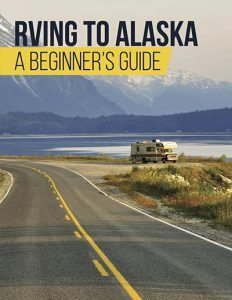 In this article we will look at living in a Park Model RV and what makes them a unique tiny house perfect for downsizing. A Park Model falls into the recreational vehicle category in the United States. 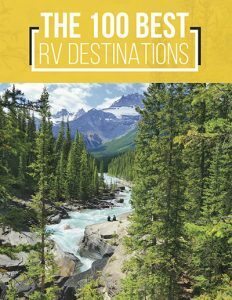 Yet unlike traditional RV’s they are usually transported to a long term location, such as an RV park or a tiny house lot. They can be set up anywhere an RV or mobile home is legal. In some counties they can be placed behind a house as long as they remain on wheels. Park models feature residential style amenities built for long term living. They connect to utilities just like a stick and brick home have washers, dishwashers and standard flush toilets. Park model RV’s are popular as a mother in law apartment, a cottage or a getaway lodges. Some RV parks rent also or sell them to the public. Tiny houses focus on minimal space, fully maximized. Floor plans are creative and often use the vaulted ceiling for lofts. The Park Model Caboose. 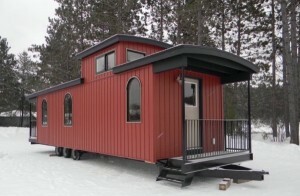 This unit was custom designed to feel like an old fashion caboose. With it’s old world wood interior this Park Model feels like a cross between a cabin and a train compartment. What do you think? This Park Model RV is an actual travel trailer style. It provides the best of both worlds for the person who plans to live in an RV park without standing out. 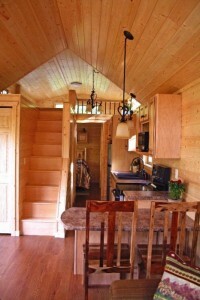 This Lofted Beauty combines the joy of living small with living well. Tall ceilings and big windows make this house feel far more spacious than it’s 390 square feet. An Eco Cottage is a modern approach to tiny living. 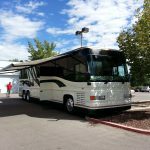 This Park Model RV is not for everyone, but if you are looking for a modern twist, look no further. A Park Model RV must be under 400 square feet in the U.S. which makes them a perfect tiny house. In general, there are three types of Park Model RV’s. The first, looks like a traditional RV using aluminum siding and offer a retractable slide out. This type of Park Model is often found at RV parks, especially in the South West. 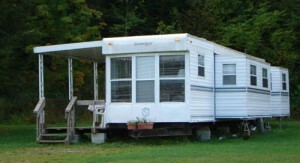 The second type of Park Model RV features traditional house siding. 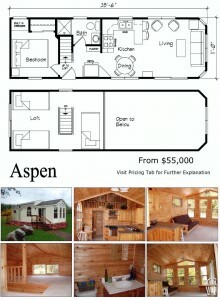 This tiny house boasts large residential windows and is even available as a log cabin look. The third and newest type of Park Model is the Eco-Cottage. Eco-cottages are built to a high standard and offer sustainable features. Sporting a fresh, modern look, these cottages combine a variety of siding options. Many creative house builders are expanding the term Park Model to include a variety of tiny homes. These Park Model RV’s have wheels because they are built on trailers pulled behind a truck. Most Tiny Homes are set up shortly after the building process is complete, but can be moved when necessary. 1. Loft Space – Loft space in a Park Model RV is often used for bedrooms or flex space. Lofts are a short -5 foot high areas that offer a variety of storage uses. 2. Full Size Kitchens- Just because a house is small doesn’t mean the kitchen has to be. Many Park Model RV’s offers full size kitchens with plenty of cabinetry. 3. Lots of Light – Residential windows warm small spaces while giving an open feel to the room. Park Models use a variety of windows to fill the tiny floor plan with light. 4. Narrow and Long or Wide and Short – Park Model RV’s cannot be over 400 square feet. This means that the total space can either be long and narrow or short and wide. 5. 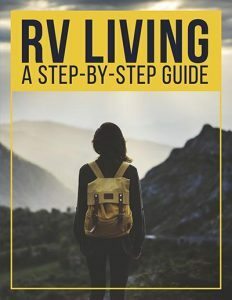 Easy To Set Up– Once a Park Model RV park in its new home, it is easy to move in and get settled unlike building a new home. Park Model RV’s are for sale all over the country and range from 20,000 to $100,000 depending on what you choose. Want to order a custom design? There are many builders who specialize in tiny homes and Park Models. 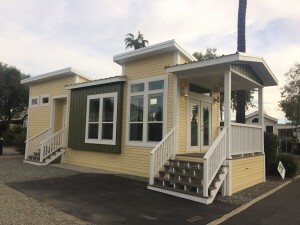 Google tiny house builders and Park Model manufacturers for more information. Another trend in Park Model RV’s is the off grid movement. An off grid park model uses solar, rainwater catchers and composting toilets which facilitates life without utility hookups. While not everyone wants to collect rainwater, many buyers are looking for sustainable housing that can be parked almost anywhere! An off grid Park Model could be the perfect choice for this lifestyle. 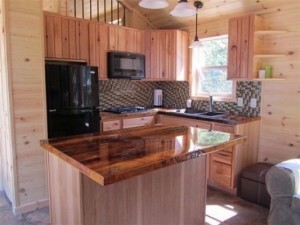 Most Park Model’s are purchased, but tiny homes like this can be built on your own. There are several companies that sell plans to the do it yourselfer. If 400 square feet seems like a lot of house for only one person, consider building a tiny Park Model of 200 or less square feet. These easy to tow units are built on trailers for easy towing. Don’t think you have the skills to build your own Park Model? Take a look at this video and discover how one teenage boy built his own home free and clear. You’ll be inspired to see what you can do! Which Park Model do you like best? Why? Could you see yourself living in a Park Model RV? Tell me your thoughts below. Leave your comments, tweet it, like it, share it. Your opinion counts. Thanks for reading!